Back pain on its own is bad enough, but when the sciatic nerve is under pressure, it can feel even worse as it travels from the back, through the hip or buttocks, and/or down the leg. It may be hard to pinpoint where the pain is coming from, but as the tingling radiates, patients find themselves wondering what they can do to stop this. 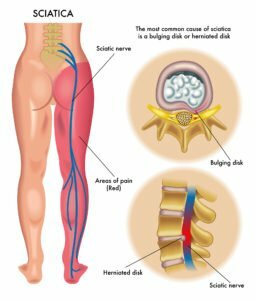 Sciatica varies from person to person and so can the symptoms. The various symptomatic occurrences can range from a mild ache to a sharp ache, excruciating pain or a burning sensation. Some patients have described sciatica as feeling like a jolt or electric shock. Usually one side of the body is affected and is aggravated by prolonged sitting. Others have experienced numbness, tingling or muscle weakness in the affected areas such as the leg or foot. The doctors at Monmouth Pain & Rehabilitation use FDA cleared medical technology known as non-surgical decompression traction. The issue at hand is that the spinal discs are pushing or pinching the nerves, which causes tingling, numbness, and electric pain. Decompression provides relief by stretching the spine and muscles to increase space and send the discs back in line where they are meant to be. Coupled with low light laser therapy, this treatment helps patients get relief quickly. Physical therapy also helps to strengthen the muscles, ligaments, and tendons surrounding the spinal column. The physical therapy team at Monmouth Pain & Rehabilitation will examine your case specifically to determine what sorts of exercises and stretches will yield the most success in relieving the pressure on your sciatic nerve. Furthermore, our highly skilled acupuncturists can work with you to promote regeneration of the sciatic nerve, reduce inflammation, and stimulate the nerves that release pain-reducing endorphins. Whether your pain is a result of sciatica, or something similar that mimics these symptoms, the MPR team will establish a plan catered to YOU and YOUR pain. There’s no need to live in this constant state of pain and frustration. Take the first step: schedule a FREE initial consultation ($245 value) with one of the doctors at Monmouth Pain & Rehabilitation. Call 732-345-1377 or fill out the form below to request a consultation at our Shrewsbury, Freehold, Wall, or Lacey facility.